If June, July and August constitute the summer months, I suppose it could be said that the summer has now bestowed half of her seasonal glories upon us. So much life gets packed into the summer months. The land is fertile, the sun shines for long hours and the projects that hibernated through the frozen winter months thaw and demand much attention. 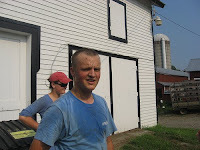 Isaac arrived home at the end of June after spending a month working at a huge farm up in Tompkins County. His arrival back home was a little earlier than expected when we found out that Clarence, who so faithfully farms the neighboring land, was going on bed-rest. Clarence is one of the types that never gets sick, never leaves town and is as scheduled as a clock itself. Bed-rest was a new chapter in Clarence's book. Isaac is now writing a new chapter in his book, too, since Clarence's bed-rest has demanded that Isaac start running Middlevale Farm in the height of the busiest part of the farming season. Needless to say, Isaac has been getting so little sleep; he has had to wake every morning at 3:25am to milk cows and then each day he faces a hefty workload of mowing, raking, baling and unloading. Farmers work so hard. In the meantime, Nate returned home from studying geology in Montana. His friend, Sean, from Princeton, came to live with the family for a little over a month. All at Bentley report that his presence has been such an encouragement. Sean is an amazing artist and has been quite successful at marketing his artwork. I hear that he is doing very well as he tries his hand at farming. 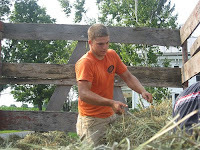 Jake has been getting his share of summer baling callouses while throwing around heavy hay bales. He has been doing a lot of grass mowing and maintenance. Recently, he has been thrilled to get trained to drive some of the big tractors. Jake's dream is to become a large equipment operator, so he is thrilled to get the practice. He has a good sense of humor and provides comic relief for the family in the midst of all the work. Hannah turned seventeen yesterday. I absolutely cannot believe that. Wow, how graphically I remember that day that my eight-year old self was so, so excited to finally have a baby sister. 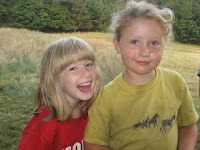 And now my baby sister is seventeen and getting ready to apply to Cornell (as a junior!) to study business management. Hannah celebrated her birthday by shopping and dining in Albany with her friend, Allie. She didn't want any gifts this year, but she requested a lunch date with Grandma, Mom and Rebecca at the local Double-O-Grill. She assured me that I would have been invited, too, if I were not in Washington. After Luke completed a huge landscaping project at the home, he started taking General Biology II throughout the day at Dutchess. His life has become pretty consumed with studying as he is also excited to soon apply to Cornell as a pre-med student. Life in Seattle has been full of both energy and rest. I have been working on a major portfolio that is due by the time of the summer meeting for my teaching fellowship (my cohort pictured below). During the days I have been enjoying studying methods in teaching physics. We've been working with a lot of materials in kinematics and we just started a new and extremely interesting unit on general and special relativity. The evenings have held much time to explore all of the recreational opportunities that Seattle has to offer. I have found a wonderful 3-mile running trail around beautiful Green Lake. The Burke-Gilman trail is also such an asset to city life and long bike rides on the trail have been just so refreshing. Especially meaningful have been my times with North Seattle Friends; we watched a fascinating (and recommended) documentary on Friday - Maxed Out - which was a much needed commentary on the state of our nation's private and public financial affairs. So, yes, we are all relishing these long summer days, be we on the East Coast or the West. These days are busy days, but such good and refreshing days. They go by as a dream, yes, as a mid-summer night's dream.